Currently Machu Picchu has become a kind of holy grail for lovers of culture of the Inca Civilization, the enigmatic Lost City of Machu Picchu is the most important archaeological site in Peru, in South America and one of the most important in the world. And this year 2016, Machu Picchu has its doors open to those who wish to live an amazing experience at this wonderful place. The spectacular collection of images on the Internet, its temples, terraces and squares, built on top of a mountain, makes "Machu Picchu" is familiar to most people in the world; yet even now, Machu Picchu refuses to reveal many of its mysteries, including the secrets of its construction, function, and their disappearance. The quality and detail with which it was built, suggests that this was a sacred place of exceptional importance. It is believed that was built during the height of the Inca Empire (around 1450), and incredibly, the Spanish never got to it, so could not be restructured or eliminated, as with other Inca sites. Machu Picchu receives hundreds of thousands of visitors each year; this Inca city located just over 2,400 m.s.n.m., owns buildings in the rugged mountain ridge of the same name, which can be accessed through the valley to the banks of the Vilcanota in the Andes. Built by the year 1400, the Sacred City was a place that flourished by leaps and bounds; before being abandoned and forgotten during the time of Spanish invasion. 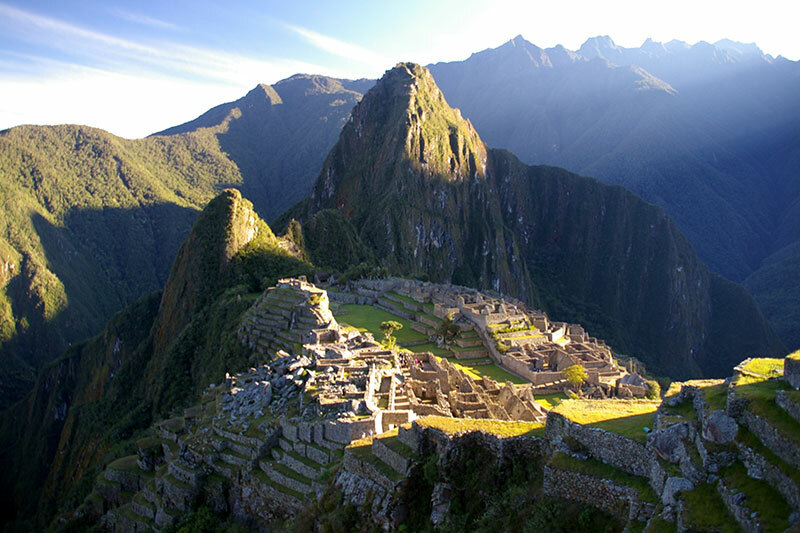 Today Machu Picchu is a World Heritage Site and one of the most desired by people worldwide destinations. It is recommended to travelers who travel to Machu Picchu in April 2016, is recommended, make alternative travel plans, if are planning to hike to the Mountain Huayna Picchu or Machu Picchu Mountain. Because the admission to these two mountains will be restricted temporarily in the month of April 2016 for essential maintenance of the Inca trails, walls and platforms. However, entry to the Inca City of Machu Picchu is totally normal. Huayna Picchu Mountain will be closed between April 1 – 15; Machu Picchu Mountain will be closed between 16 – 30 April 2016. Most people who enter to Peru, do it through the Jorge Chavez International Airport in Lima, from this place can get direct flights to the city of Cusco, the ancient capital of the Inca Empire. Cusco is undoubtedly one of the most cosmopolitan cities in South America; in addition to having numerous historic sites, it offers a unique multicultural experience, and serves as a base for hiking in the City of the Incas, Machu Picchu, located 120 kilometers northwest of Cusco. You can take buses or taxis from Cusco to the train stations, located in the villages of Poroy and Ollantaytambo. After boarding the train, it takes between 1 ½ to 3 hours to reach Machu Picchu, depending on the station where you board. The final train stop is in the town of Aguas Calientes, where you can board a bus that will take you to the Inca City of Machu Picchu. Alternatively, you can get to Machu Picchu from Cusco hiking the Inca Trail. This intense hike takes 4 days to complete. It is illegal to do the Inca Trail without an authorized agent, so if you arrive by this route, must be booked months in advance. All the Sanctuary of Machu Picchu is fascinating, but some places stand out as points of interest. Among these are the Temple of the Three Windows, caretaker’s cottage, the Royal Tomb, the Sun Temple, the Sacred Plaza, the Temple of the Condor, Sacred Rock and the Intihuatana (solar clock). You may also wish to climb Huayna Picchu, looming over Inca City; it takes about an hour climbing to reach the top, but you will be rewarded with breathtaking panoramic views and access to the impressive Temple of the Moon at the summit. In this case you have two options: make the trip to Machu Picchu early in the morning; then your visit to Machu Picchu, addressing the train back to Cusco and overnight at your hotel. Or maybe you prefer to spend the night in Aguas Calientes or Machu Picchu Pueblo; this last option gives you the opportunity to enter the Sanctuary of Machu Picchu very early, long before the hordes of tourists arriving by averaging 11:00 hrs. Not only it extends their stay, but will have the chance to be in Machu Picchu, more alone as possible. However, keep in mind that luxury accommodation can be very expensive; even low-end hotels have high prices, relative to other places with the same services. The different types of ticket to Machu Picchu, allow entry to a limited number of people every day, so please take the necessary precautions to enjoy your trip in the time you have planned, especially if you arrive in peak season. Book early is the best decision, as you would not like to get to the city of Cusco and miss a visit to one of the 7 Wonders of the World. The peak tourist season coincides with the dry season (April to August) in the mountains of Peru. Technically it’s winter here, however, the days are sunny and dry. Winter in Cusco is relatively warm in the day but very cold at night. Unlike the summer season (December to March), which has heavy rains, hindering tour of Machu Picchu, and especially the Inca Trail because he rains cause landslides causing a more difficult journey. You should consider making reservations of Ticket Machu Picchu, Train ticket and accommodation well in advance, to avoid the difficulties of finding accommodation during the peak tourist season (April to August), where prices can double.